Fluf's Organic Cotton "Zip Lunch" is made with 100% certified organic cotton and a tested food-safe lining (free of BPA, phthalates and lead). It’s effortless, durable and easy to keep clean (machine washable with a wipeable, water-resistant lining). And with its zipper closure it'll keep everything in the bag, where it belongs. Love this lunch bag! 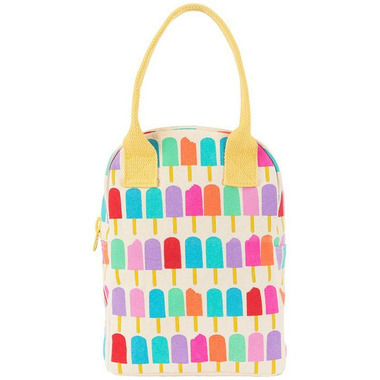 Very cute, big hit with my daughter, and finally a bag big enough to fit her lunch and water bottle. I love this product. There is lots of room inside this product for small lunch box and there is a sleeve inside for a your water bottle or a juice bottle. The zipper works great too. This product a very well made, I am very happy with this product. 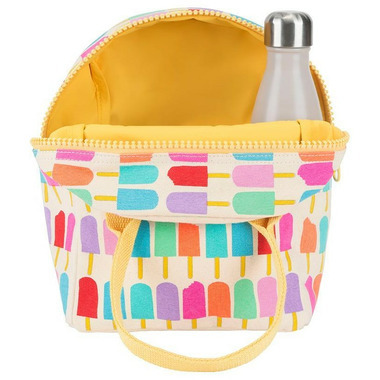 I love this lunch bag, it's surprisingly spacious and the zipper is a nice feature!